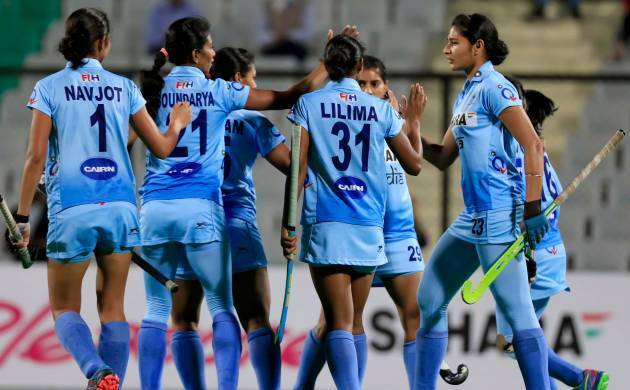 The Indian women's team secured a berth into the grand finals of Hockey World League Round 2 after a 4-0 thrashing of Belarus in the semifinals played in West Vancouver, Canada. India now play Chile in the summit clash. Chile had beaten Uruguay 2-1 in the second semifinal. With this semifinal victory, India won a berth to take part in the Women's Hockey World League Semi-Final to be held in June/July, which is a qualifier for the FIH Women's World Cup 2018. India were dominant the side right from the start. Even though Belarus won two early penalty corners in the fourth and the ninth minutes, the Indian team's defence was impressive as they denied an early lead to their opponents. India were quick to earn their first penalty corner in the 13th minute and it was Gurjit Kaur whose stunning goal gave India a 1-0 lead in the first quarter. India took 2-0 lead in the 20th minute through skipper Rani when she successfully converted a penalty stroke. Both teams traded penalty corners in the third quarter with India winning one in the 33rd minute but the strike was wide. Belarus, on the other hand, won a penalty corner in the 40th minute but Yuliya Mikheichyk's hard-struck drag flick was saved by India's goalkeeper Savita. The Indian women played fast-paced hockey, breaching into the opposition striking circle quite often. Rani made a solo attempt and scored a brilliant field goal that took India's lead to 3-0 in the 40th minute. Though Belarus were awarded a penalty corner in the 42nd minute, their attempt to score was denied yet again by Savita, who continued to be impressive at the Indian goal to ensure her side stayed on course to victory. The final quarter saw Belarus making desperate attempts to come back into the game. They began the quarter with a penalty corner in the 49th minute but was promptly denied by Savita. It was Gurjit Kaur's splendid penalty stroke goal in the 58th minute that took India's score to 4-0 and sealed the match.